The author briefly covers developments in Europe in the years preceding the Civil War. British riflemen, Hungarian grenzers, German jägers, and French chasseurs, tirailleurs, and voltigeurs are covered, along with certain French ideas such as infanterie légèr and levée en masse. The use of these troops varied wildly by army. Some equipped these light troops with smoothbores only, while others went more with rifles. Some armies formed full units of light troops, while others parceled them out by the company to line battalions. I am fairly comfortable with the terminology and tactics discussed in the chapter as I am also interested in European military history, especially the Wars of Succession and the Napoleonic Wars. Ray allows this brief description without getting too bogged down in the details, allowing the reader a brief but interesting glimpse into how light troops were used in the European armies. In Chapter 2, the author shifts gears and concentrates on the development of Riflemen in the extremely wooded lands of America. Riflemen armed with the Kentucky rifle played a role in the American Revolution, picking off officers and others who displayed gallantry and generally demoralizing the opposition. George Washington formed a Corps of Rangers during the war, but the numbers of riflemen were diminished slowly as the war wore on. Although the Kentucky rifle could reach long distances, shortcomings such as its brittle nature as a hunting rifle and the lack of a bayonet made Washington and others reluctant to use riflemen unless they were protected by line infantry. Between the American Revolution and the War of 1812, riflemen were used sporadically. Ray mentions that a new “short rifle” based on German jäger designs was introduced in 1803, and that this new rifle was superior to the Baker rifle, its British counterpart. The new rifle was used by the new Regiment of Riflemen in the War of 1812. Ray discusses the various exploits of the American riflemen and their British counterparts, noting especially their deployment by Andrew Jackson at New Orleans in 1815. Several rifle units in the time between the War of 1812 and the Mexican War are then discussed, including the Regiment of U.S. Voltigeurs and Foot Riflemen and also the Regiment of Mounted Riflemen, both of which were organized in the 1840’s. Due to lessons learned in the Mexican War and in conflicts with Native Americans, both light units and individual sharpshooters (what we would call snipers today) fell out of favor by the time of the Civil War. This chapter is dominated by French tactical innovations and units. The French Army had to deal with an insurrection in Algeria from 1830-1847, and the natives at first were able to pick off musket-armed French soldiers with near impunity. The French created new tactics and armed their units with rifles. The result was the now-famous Zouave units, who later participated in the Crimean War and in Italy in the 1850’s. Individual initiative and small-unit tactics were priorities in the French system, and Ray calls both innovative in the military world of the mid-19th century. 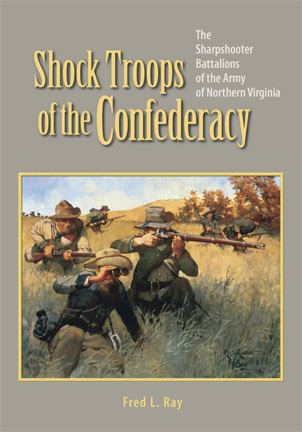 Confederate General William Hardee translated the French light infantry system literally word for word in his Rifle and Light Infantry Tactics, released in 1855. As the French further refined their methods, American officers read with interest various military journals and went on observation missions to see the theories in practice. Europeans began establishing formal schools to train their officers and men in the new tactics. This did not happen in antebellum America, though the 10th Infantry Regiment became in practice if not in official designation a light infantry unit. Ray says that, in typical American fashion, the unit was broken up into parts and sent to fight Indians on the frontier. The need to fight Indians in company sized units meant that specialization of flank companies all but disappeared in America. Ray concludes the chapter by saying that the French ruled 1850’s military thinking. Since their Zouave units had executed many successful bayonet charges in the late 1850’s, conventional military wisdom began to point to the bayonet as the king of the battlefield. Ray points out, however, that the Zouaves took heavy losses, and opposing riflemen were able to kill or wound many French officers. American officers failed to note this last point, and they started the American Civil War in this way. Ray’s book has been very interesting so far. The author’s advanced reader’s copy contains many illustrations and diagrams with the accompanying text. I look forward to continuing this summary and review series of posts over the next few weeks. Usually look for these entries to appear at the beginning of each week.